Sunday, Oct. 29 3:00 - 5:00 p.m. The Erie Art Museum presents one of the newest jazz voices to come from Latin America: the Gabriel Alegría Afro-Peruvian Sextet, for a return engagement. Fusing contemporary American jazz with the ancient rhythms of his native Peru, Gabriel Alegría will bring his unique form of world jazz to the Museum’s stage on.Sunday, Oct. 29 from 3:00 - 5:00 p.m. , can be purchased online at erieartmuseum.org or at the door. One of the most influential figures on the current jazz scene in Perú, Gabriel Alegría combines his experience playing jazz as it developed in the U.S. with a passionate interest and careful study of the black music of coastal Perú. By incorporating and exploring the common African roots found in both styles, he has developed a uniquely Afro-Peruvian jazz music concept. The rich legacy of the black music of coastal Perú can be heard in contemporary jazz context. In all of Alegría’s work, a cross-cultural exchange between the Americas is always present, carefully defining Afro-Peruvian jazz music as the newest voice to come from Latin America. 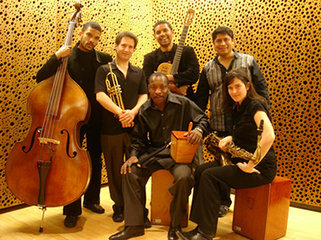 Algería has had a significant presence on North American Radio and his recordings reached the top of Jazz Week World Music Charts and CMJ Jazz Charts. Alegría successfully presents a true cross-cultural exchange between the Americas, and he has been lauded on both continents as one of the newer and fresher voices to come from Latin America. Currently Associate Director of Jazz Studies at New York University, Alegría earned a doctorate in jazz studies from the University of Southern California, a master’s degree from the City University of New York and a bachelor’s degree from Kenyon College. His knowledge of Afro-Peruvian music is the result of fieldwork and time spent at home in Perú learning the art form’s greatest exponents.